Porticos Art Space 2033 E. Washington Blvd. 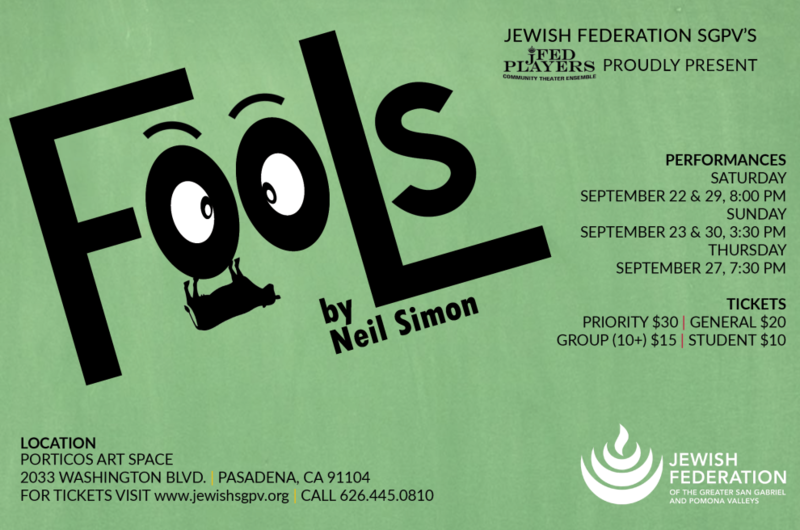 Fools is a comic fable by Neil Simon, set in a small Ukrainian village, around 1890. The story follows Leon Steponovich Tolchinsky, a schoolteacher, new to the village, who becomes a tutor to Sophia, the daughter of Dr. Zubritsky & his wife, Lenya. Leon senses something odd about the little hamlet and learns that there is a curse on the village that makes everyone in the town stupid and unable to fall in love until the curse is broken. Complications ensue when Leon falls in love with his pupil.